You have recently conducted Haydn's Oratorio Die Schöpfung/The Creation in Leipzig, a work which finally is deservedly becoming somewhat popular with conductors, concert seasons and audiences. As a young conductor, what have been your ideas, feelings and reflections on Haydn's music, approaching this magnificent work? I love Haydn and so I was very happy to conduct this piece. When I was 12 years old, I started playing violin. Haydn wrote so many works for this instrument... Sonatas, string quartets, concertos... That was my first contact with Haydn! Being a conductor now, I have studied so many of his orchestral works, during these years, too, and discovered that he's really really an amazing and very brilliant composer. Haydn should definitely be performed more often! You see, there's so much esprit, so much wittiness in his music! It's always a great pleasure for me to conduct his works. I had already conducted the The Creation in 2008 during my first studies at the University of Music in Trossingen. And now, 8 years later, it has been so interesting to discover so many completely new facets in this masterpiece: what an amazing richness of effects, lights and dynamics! The Creation is a powerful musical composition and I think that the effects of lights, conceived by Haydn, really play an extraordinary role in this work! In fact, with the wise use of the dynamics Haydn did really manage to captivate and fascinate his audience. During the premiere, in 1799, there were, at the same time, on the one hand, a breathtaking silence in the audience, during the performance, and, on the other, an ecstatic tumultuous applause between the sections of the work, as in the famous account by J.Berwald. People had never heard something like that - it must have been an incredible atmosphere! In the final part of The Creation, in the duet of Adam and Eva, Haydn shows off all his brilliant ability in using various scales of emotion and invention. That's nearly Opera! You see, The Creation is a work that creates an incredibly vivid connection among choir, orchestra, soloists, the conductor himself and the audience. There are so many historical documents in Europe and also in the 19th century Americas that retell us about the enthusiasm that The Creation always caused everywhere. Art wants to move, to fascinate, to inspire! The Creation always accomplishes that aim by abducting both performers and audience and leading them into a completely different world! The more I study that piece the more I admire it. With the SommerOrchester you are developing a wonderful and intriguing project (Opera Casa), performing even extremely challenging and difficult opera works (ie. Wagner's Der fliegende Holländer/The Flying Dutchman) in private houses with a full scale orchestra and singers. If you consider that it's almost sure that even Mozart used to perform his major orchestra works, like his 3 last 1788 symphonies (among them the Jupiter) and probably also many parts of his opera Così fan tutte, with an orchestra in his private home in a room ca. 60 mq (you used a 70 mq for Wagner's Holländer!) and, possibly, also in his garden, do you think you are really reviving this beautiful classical music original tradition of the great masters? And what is your mission for your SommerOrchester season and what was your first ideas, when you conceived such a particular music season for the first time? Ah, what a wonderful experience to revive this musical tradition! 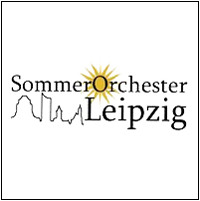 Our aim with our SommerOrchester Leipzig is to play during summertime but also, at the same time, to perform operas and symphonic works at completely unusual places! Why? Because it's exciting! I have just discovered that many people don't have any contact with classical music at all! When you ask them if they have ever attended a classical concert, they just answer no and when you ask them why, they answer that they are afraid, because they don't know what to do in a concert hall... They think they have to read many books, before going to a concert, they don't know how to behave, what to do and often they are even afraid of not to understand the music... There are somehow so many fears, you know... and we want to show that actually you don't need to read a book, to wear a special dress or to understand anything! You just have to be there and listen to the music! Such simple! The great thing about our Opera Casa season is that the audience is so close to the musicians and the singers. They see all the mimics and they can look right into the eyes of the singers and of the musicians, they can see also all the interactions among the orchestra musicians. Normally, when you listen to performances in opera houses, the singers are so far far away and you don't see a lot of the orchestra, as the musicians sit in the orchestra pit... So our Opera Casa is a fascinating experience for the audience and also for our musicians, since you play for people, who only sit some metres away. Our audience does really love our Opera Casa season! We have even received emails from people who told us that they didn't like Wagner before, but now that they have had the possibility of attending our own Holländer and of listening to it in such a vivid, direct and personal manner, they are as infected and now will listen to even more operas by Wagner. What an amazing compliment to us! You see, in the beginning we just wanted to play Humperdinck's Hänsel & Gretel... but this first Opera Casa was such a great success and attracted so many people that we decided to continue and to give start to a whole Opera Casa season! When we played Wagner's Holländer in May, we were literally overwhelmed by people... the listeners occupied even the staircases! And now our audience is increasing from performance to performance! And we are really happy about that and we're very curious in discovering where our journey will lead us! Since you live and work in Leipzig, you cannot avoid a question on Bach. Unfortunately today the close relation which existed between Bach's music and Mozart's last major works is not so well present in the mind of many performing musicians and especially in that of more general audiences, a relation really fundamental, if you consider that Haydn, Mozart and Beethoven all studied music on the manual and on the works by C.P.E.Bach, one of the children of J.S.Bach, and that the music and the figure of J.C.Bach, the other son of J.S.Bach, were crucial to the musical development of the young Mozart, when a Wunderkind. How do you think we can better celebrate this profound influence of the Bach's family, in its entirety, on the whole history of music, also beyond J.S.Bach himself? That's right: a lot of people don't have in mind the importance C.P.E. Bach had for the whole development of Mozart. I think we, as performers, absolutely have to study his book Versuch über die Art das Clavier zu spielen. Without the knowledge of this book it's nearly impossible to perform any Mozart or Haydn symphony, opera or oratorio correctly... this is a fantastic guide to the understanding of classical works! I think, we can better celebrate this profound influence of the Bach family in only one way: concerts! And what a funny coincidence: I will conduct a concert in Leipzig with a Bach family programme in November 2016: J.S.Bach Reformationskantate, C.P.E.Bach Magnificat and W.F.Bach Ach, dass Du den Himmel zerrissest. The concert will be with the Leipziger Oratorienchor and the Mitteldeutsches Kammerorchester and I'm really looking forward to conducting such an exciting all-Bach-family programme! As a young conductor yourself, do you think you have some pieces of advice for those, who want to follow this beautiful career of orchestra conductor? And what do you think of the works by such an important figure of 18th century Viennese music life like Marianna Martines/Marianne von Martinez, the pianist, virtuoso singer and composer who spent many soirées playing 4-hand keyboard works with his friend Mozart and who introduced young Haydn to Porpora? She was sometimes even compared to C.P.E.Bach himself - and here Leipzig again! Well, difficult to give any type of advice... I think... just study as many scores as you can and listen to a lot of rehearsals and concerts by experienced conductors... and always make music with all your heart, all your soul and all your passion! Women composers and women musicians are one of my next upcoming projects. We're currently building up a professional all-women symphony orchestra: the Leipziger Philharmonikerinnen. For our first concert series, we have chosen Mozart’s Requiem in November 2016 and we are going to perform it both in Leipzig and in Berlin. You can imagine, how we are already looking forward to our first performances! And of course we want to play music by women composers in the near future, too. There are so many magnificent masterpieces composed by women... but, unfortunately, really never performed! Did you know that there are, for example, ca. 500 (!) operas by women composers? And there are as many symphonies, chamber music pieces, concertos, all by women composers, too! I often go to listen to concerts, but I have never heard any opera or any symphony composed by a woman performed in an Opera Theatre or a Concert Hall. We'd like to change that! There are really brilliant compositions and various masterpieces... and we can't wait to play them. Mozart, Don Giovanni, and Haydn, The Creation. W.F. Bach; a brilliant composer! One of my dreams is to perform all of his orchestral works and cantatas. The Bach-Archiv Leipzig is about to publish a complete edition of his works. I'd really love to conduct all his works! Name a neglected piece of music of the 18th century you'd like to see performed in concert with more frequency. All music by W.F.Bach & Haydn's symphonies! Have you read a particular book on Mozart Era you consider important for the comprehension of the music of this period? C.P.E.Bach, Versuch über die wahre Art das Clavier zu spielen, & Leopold Mozart, Versuch einer gründlichen Violinschule. Carceri d'invenzione with Yo-Yo Ma performing Bach cello suites in a computer designed three dimensional version of Piranesi's Carceri d'invenzione (Prisons of the imagination; 1750). Breathtaking! Do you think there's a special place to be visited that proved crucial to the evolution of the 18th century music? Weimar, where J.S. Bach also lived and worked for so many years, and a very interesting and beautiful city. W.F. Bach was born there, too. Moreover, the famous Princess Anna Amalia was also a great supporter of the arts and even a composer herself! So true! And what a profound connection with the people of the Haydn and Mozart Circle, from the truest Weimarian spirit of The Magic Flute to Hummel (Weimar Kapellmeister), Beethoven (an avid, and critical, reader of Goethe and Schiller) and Liszt (the last son of Esterházy and Vienna and the most famous successor of Hummel)! Thank you very much for having taken the time to answer our questions!